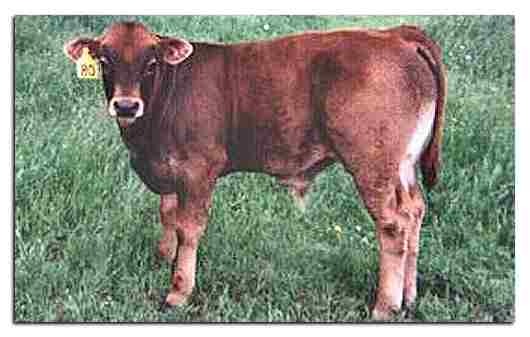 Please click here to view a comparison between Angus and Aubrac cattle, kindly provided by Chad Armstrong. You will need Adobe Reader to view this file in .PDF format, if you need to download the viewer, here's the link. Enjoy the view! Here are some characteristics we like about the Aubrac. Healthy udder on a 13-year cow named Ginger. Udders stay healthy and compact longer. The cows' udders and teats are moderate in size and maintain their shape. Aubrac consume about a third less feed than other cows do, in our experience. Aubrac will calve close to the same date each year, and will seldom have twins. These cattle handle the cold of northern Alberta extremely well (temperatures range from 30C in summer to -45C in the winter). Aubrac develop a good heavy coat in the fall, and their black pigmentation prevents them from sunburn in the summer. Aubracs put on miles each day as they just wander, eating whatever is in front of them at the time. They will clean up the weeds from winter feeding, leaves off the trees, sagebrush, or slough grass, whatever they happen to be ambling through at the time. The Aubrac also keep their body condition when put out on grass or when brought in for hay. Our cows are not fed any grain. In France, Aubrac cattle were introduced into terrain that was weed-infested, difficult and neglected, and deserted by other breeds. Aubrac's need for movement to find water and food in harsh terrain, winds, and huge fluctuations in temperatures shows the endurance of the Aubrac. Aubracs rank first in age at first calving, unassisted calvings, have the shortest calving interval, and the greatest longevity of all French breeds. 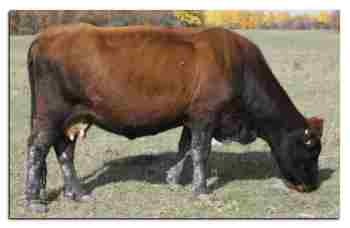 We have been using Aubrac bulls on our ranch for 15 years. We have never had any births that have needed assistance by a vet. We use these bulls on everything including our heifers. On the rare occasion where assistance has been required, we have taken care of it right out in the pasture. 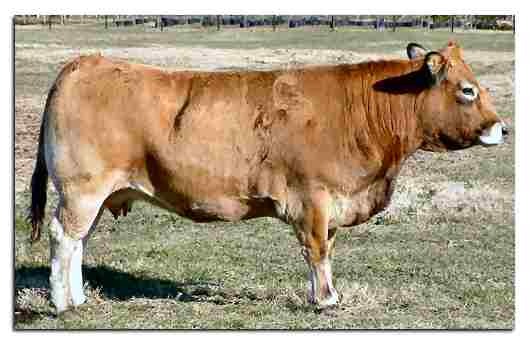 Aubrac cows have excellent udder capacity, attachment and teat size. 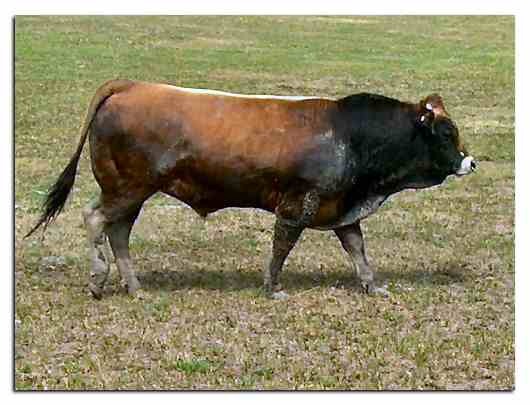 Mature bulls range from 1,875 to 2,475 pounds; mature cows typically weigh between 1150 and 1400 pounds. Beef producers are consistently impressed with the 'grass gains' and feedlot performance of their Aubrac calves. Bull development tests and feedlot performance of steers indicate rapid gains, with the ability to flesh and finish at desirable weights. Generations of selection for functional traits has resulted in correct, good-footed cattle that can navigate rugged terrain. Longevity records support the soundness and trouble-free characteristics of the breed. Carcass data on Aubrac-cross cattle indicate that Aubracs are superior to continental cattle for quality grade. Aubracs are structurally sound and problem-free cattle, possessing excellent foraging abilities and maternal and reproductive soundness. They are extremely easy-keeping cattle, and they produce well-muscled but high-quality carcasses. What Is Their Primary Strength? Foraging ability! For centuries the breed has been developed and selected for foraging ability. These are deep-gutted, moderate-framed and extremely rugged cattle -- ideally suited for the demands of today's pasture-based beef production systems. Why Weren't Aubracs Brought to Canada Earlier? In the late 1960s and 1970s, no one was looking for moderate-framed cattle, so Aubracs were overlooked. Is the Breed Becoming More Popular in Europe? Absolutely. In fact, in recent years it has become Europe's fastest-growing beef breed. During the last five years, farmers from across Europe have come to southern France to buy Aubrac cattle. The breed can be found in Russia, Hungary, Germany, Great Britain, Ireland, Poland and many other countries. "Aubracs have been developed and selected for foraging ability. These are deep-gutted, moderate-framed and rugged cattle ... ideally suited for the demands of today's pasture-based beef systems." Aubracs are deep-bodied, naturally muscular cattle. Aubrac bulls possess natural mass and muscle, combined with structural soundness. Females are feminine, easy calving, and forage efficient. 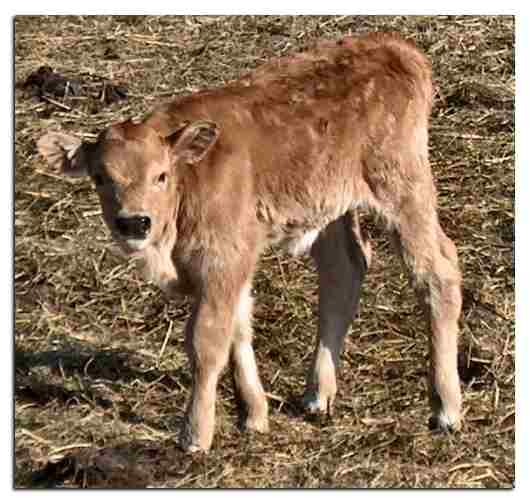 Calves are slender at birth, weighing an average of 75-83lbs. At about 6 weeks, their head and shoulders spread, and muscling starts. This is a 90-day-old calf. "Aubracs are moderate-framed, highly maternal, and have been developed for limited-feed environments." genetics possible for quality beef production.